Want To Develop Speed In Your Martial Arts Skills? 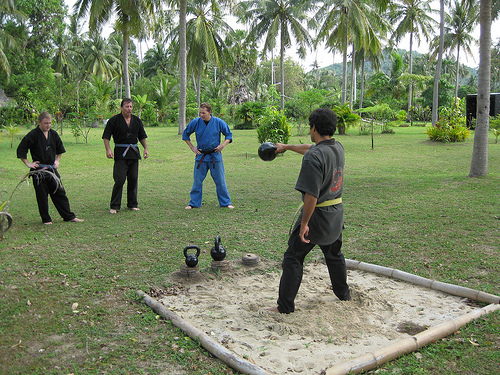 A number of martial arts skills can be done at full speed. This could be against a target, with a partner or in the air. You should note that gross motor skills can easily be adapted for speed training as compared to the precision skills. Until you have mastered the basics of a physical model, never try to build the speed. If you are performing a skill without the right biomechanical form, you will definitely limit your potential for speed development. If you want to be great at speed skill, then learn how to relax from the point of initiation, all the way to that of impact. Your muscles may be a bit tense at the point of impact, but this should be brief because you need to relax again in order to facilitate quick recovery. One thing that you need to put into consideration is recovery between executions. This is very important for improving speed. If for instance you are training a front kick skill, the recovery between your kicks can be made brief, up to fifteen seconds. For combinations of skills, you want to spend a bit more time between the repetitions in order to prevent getting fatigued too early. You may want to put speed training early in your workout, but chances are high that you can become too fatigued to handle other workouts later in the session. While it is not wrong to do so especially if you are flexible or have good muscular endurance, practising speed skills near the end of your workout can also be helpful because this is when your muscles are looser and easier to relax. The number of repetitions of each and every skill should be kept low, but make sure that the quality of each repetition is very high. Make sure to concentrate on each repetition and don’t forget to rest between the repetitions. Sometimes, you may find that specific fast repetitions feel different from the others. So, try to capture this feeling and recreate it when performing, whether it is a feeling of relaxation, energy, lightness or intensity. Developing speed skill can at times feel like you have hit the bump. Usually, this is a pace that you are able to imitate but cannot break through. In such cases, it is prudent to take some days off from speed training. Calasanz Martial Arts & Fitness Centre is a world class martial arts training centre that works to ensure that everyone meets their goal. We train on all kinds of skills and we welcome all to come and train with us. ← Let’s Talk About Strength And Conditioning For MMA!